For me, every day is Earth Day. Yet it is awesome to devote one day a year to raise awareness for the eco-friendly holiday. 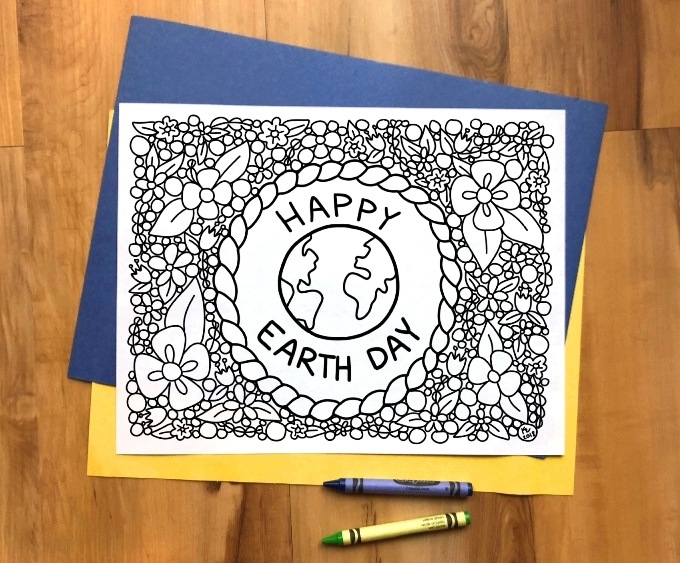 Earth Day is the perfect time to teach kids about how to be kind to the planet, and this Earth Day Coloring Sheet is a great way to celebrate the day. Our free printable is perfect for use in a kids classroom, homeschooling, daycare parties or any other Earth Day event. This Earth Day Coloring Sheet doesn’t have to be just for kids, though! I’ve had so much fun coloring in adult coloring books, too. So I think the older kids can enjoy this free printable coloring sheet, too! Share this Earth Day Coloring Sheet on Pinterest or on Facebook with your friends and family. You can print it immediately! To download the Earth Day Coloring Sheet from our Free Library (it’s full of lots of fun downloads! ), sign up for our newsletter and the password will be sent immediately! And be sure to check out our Earth Day Pinterest Board with lots of Earth Day activities, crafts and food ideas.